While the rest of the world slips on groovy sunglasses, floppy hats and hippy ware to remember the music of the Summer of Love, Peter McQuaid is launching a new museum in San Francisco to celebrate the poster art movement that blossomed around the same time. The Haight Street Art Center will open its doors on July 1st — as a destination for the past and future of the poster art genre that shined a dayglow spotlight on artists like Stanley Mouse, Wes Wilson and Lee Conklin. The 12,000 square foot former college building housing the center on Haight and Laguna Streets is anchored by a massive bronze bunny by artist Jeremy Fish which sits out front. The stairway walls in the Haight Street are covered in psychedelic posters for the modern band Moonalice. Inside, free-to-the-public galleries are lined with brightly-colored posters advertising concerts and gatherings for quintessential sixties artists like Joan Baez, Jefferson Airplane and the Grateful Dead. The walls of the building’s stairway are covered with a solid blanket of modern psychedelic posters for the band Moonalice. Artist Stanley Mouse strolled into the center on a recent day, lugging one of his classic 60s-era posters to show McQuaid. Mouse created the Grateful Dead’s iconic skeleton and roses for a poster — a motif that would go on to adorn everything from t-shirts to cigarette lighters. His poster for the Human Be-in with an Indian man ensconced in a purple triangle is considered one of the iconic images of the era. 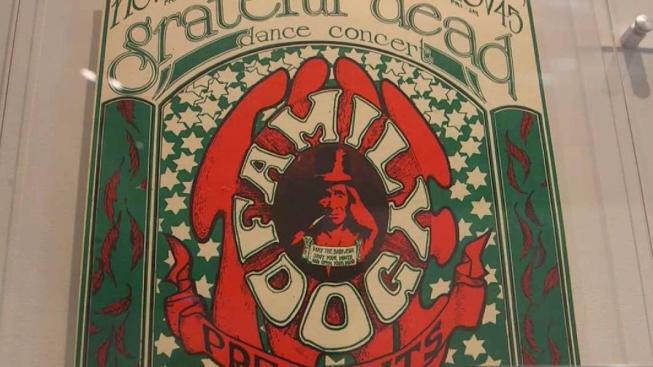 During the late sixties, band posters evolved from pictures of musicians standing in front of a wall with succinct show information - to full-blown psychedelia illustrations with hidden symbols and even some that shape-shifted with changing colored lights. The posters became an outlet for artists who could let their imaginations run wild — often with the aid of LSD. Haight Street Art Center founder Peter McQuaid (left) and artist Stanley Mouse look over Mouse’s original artwork for the Human Be-in gathering. McQuaid said although the center is opening with an homage to the 1967 Summer of Love artwork, its mission isn’t stuck in the past. The center will rent out studio space and equipment to current artists as a way to ensure a future of the movement. The building is an artist cooperative that will eventually be run by artists for artists. With San Francisco’s rent crisis forcing many artists out of the city, McQuaid hopes the center will be an artistic wrung in the ladder of survival. McQuaid, who grew-up attending concerts in the sixties, said he sometimes appreciated the art more than some of the bands. He sees the center as an homage to a uniquely Bay Area art form that helped define an era that is still celebrated and influential. The posters’ elaborate images and unique lettering distracted from the fact that it was indeed at its core — advertising.